We are just getting started this year with aquaponics. Right away, the weakest link with aquaponics is it usually relies on the grid to keep it going. You need electricity to run the pumps that run the system. In our system, all of the electricity comes from 1000 watts worth of solar panels. The pumps are used to get the water from the fish tanks up to the flood tanks. From there, gravity does the rest of the work. The water in the flood tank reaches a certain level which engages a flapper valve like the one found in most toilets today. The water flows down out of the flood tank and into a manifold system that empties into the grow beds. The water fills the grow beds and then empties out into a guttering system that returns the water back into the fish tanks below. It’s a simple and efficient design. 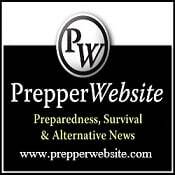 As a homesteader with a mind towards being a survivalist, I really wanted to maximize our efforts in growing food. Aquaponics helps us do that. A mature system can grow a lot of food very fast. What is a mature system? Maturity comes with time that allows the bacterial colonies in the grow beds to become established. It’s the bacteria that works to change the ammonia rich fish waste into useable plant food called nitrates. Our system is pretty new and just starting this year to create the needed bacteria to allow plant growth. While we are seeing good growth, maturity will greatly increase the amount of growth we will see in the future. 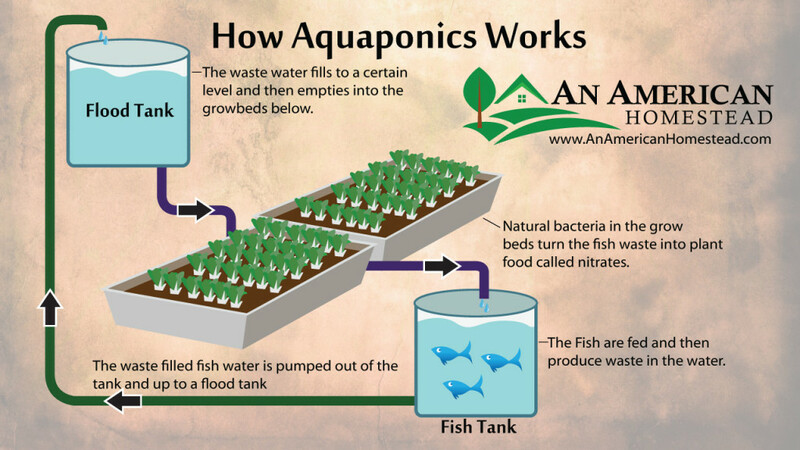 besides plant growth, the other added benefit of aquaponics is fish production. Both my wife and I love fish. We are growing about 300 bluegill fish in our system. They will take about 18 months to reach very good harvest size. We could probably harvest in 12-14 months but I really want our fish to reach a large size and so I think we will grow them a full year and a half before we start to harvest. At that time, I’m planning on combining some fish into tanks and starting new fish. Right now, I have 75 or so bluegill in each of the 4 – 250 gallon tanks. At 18 months, I’ll begin to harvest while taking one tank of 75 fish and dispersing them into each of the other 3 tanks. I can then start the empty tank with new fish. I will harvest out of one of the 3 tanks with mature fish and 6 months later with that tank empty, start a new tank with fish. This will begin a cycle that will allow me to constantly harvest fish and restart a new tank every 6 months. At some point, we will build a breeding program for the fish so we don’t have to purchase them. Right now, blue gill fingerlings are selling for about 0.40 each and they are about 2-3 inches long when we get them. It’s August as I type this and very soon fall will be upon us. My plan this fall is to use the aquaponics system to grow as many fall and winter vegetables as possible. 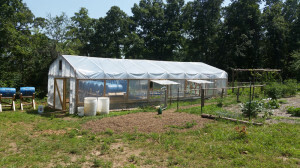 Our system is under a greenhouse we constructed this spring. We feel this will give the system an additional growing season even during the winter when things like kale and some spinach varieties will do well. Leafy greens are something my family really missed during last winter. My only concern this winter is keeping some of the piping from freezing if it gets too cold. We had an abnormally cold winter this last year with the temps twice reaching -4 degrees. That is unheard of in the Ozarks! Also with colder weather, comes reduced microbial activity meaning the bacteria in the growbeds are not going to be producing as much nitrates for plant food. I’m hoping that we can keep enough bacteria working to continue filtering out the waste water for the fish to keep them healthy. It all comes down to keeping the greenhouse at a respectable temperature. A backup plan is to construct some sort of mass rocket stove to fire up and keep the greenhouse warm if temps get too low. 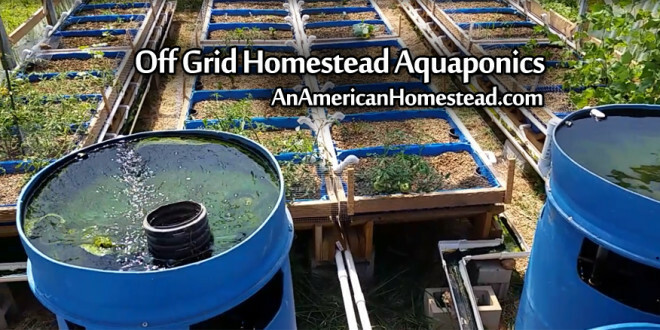 Aquaponics is a huge part of our homestead food plan. Stay tuned, we will be posting continual updates on the system and the successes and failures we encounter as we go along. Also be sure to subscribe to our youtube channel as we will be doing video updates as well this fall and winter. Next Is 100% Whole Grain the Best Flour? Why I Mill Flour Myself. So you can keep the fish alive in the barrels even in winter? I’m interested in doing this on a smaller scale, but we are in MN…-4 and below would be very typical and expected. I’m unsure if this would work for us or not. We are not currently homesteading, but are in the process of buying land and getting set up. Do you discourage homesteading in colder winter climates like MN? We plan to be off grid. I know I’m a little late to answer this but you can do it in freezing weather. You use a greenhouse and bring in compost piles which radiate a ton of heat. I am looking into aquaponics for my home next year. Would love to have an update to see how your system is working. I’m not off grid but looking for ways to improve the food my family and I eat until I can get them off grid. Yes we will keep our audience updated on the system. Be sure to subscribe to the youtube channel for future video updates! 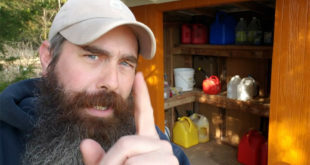 Love what you’re doing, about to do an aquaponics system in Fayetteville myself. How is it going for you so far, in terms of harvesting fish and keeping up with waste? 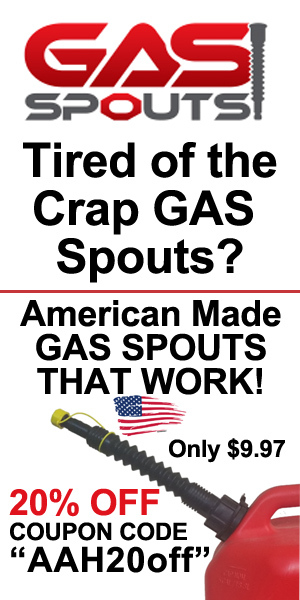 What are you using for your growing medium? I like the look of your system. Thanks for the great information! I have a few ideas for you guys. If you put those barrels down into the ground… there should be several benefits for you. On cold winter nights when the air temps in the greenhouse drop below the water temps in the barrel… the water in the barrels will release their warmth. The now cold water will sink to the bottom of the barrel and be replaced with warmer water that will in turn release it’s heat. So the barrels themselves will begin to syphon ground heat into the greenhouse. The barrels would be out of the way and so there would be a little more room in the greenhouse. Any insects on the floor in the greenhouse will assist with feeding the fish. If the barrels were outside you could use pond liner to create a edge of shallow water around the barrels and direct rain water to keep it filled. Planting rice in the shallow water since ducks won’t eat it. Then get some ducks since they love to poo in water. They would gather nutrients from around the yard and deposit it into your system. So it would be naturally sustainable. Dragon flies/frogs/etc would be attracted to the water. Creating lots of predators on the ground… and in the air. Just throwing some things out there. I really like this idea. It’s something I’ve wanted for about 40 years! Now I think I’m ready, and with your help I’ll succeed. Please keep in touch with me. hello! About how many hours between flushing the water from the fish tanks to the flood tank lapse on a daily basis? It cycles about once an hour. It is turned off at night.